The Formosan subterranean termite is an invasive species of termite, often nicknamed the super-termite because of its destructive habits. A mature Formosan colony can consume as much as 13 ounces of wood a day (400 g), and severely damage a home or structure; in as little as three months. Rarely found north of 35° north latitude, Formosan termites infestations have been reported from eleven states, including: Alabama, California, Florida, Georgia, Hawaii, Louisiana, Mississippi, North Carolina, South Carolina, Tennessee, and Texas. For the moment though, the distribution of this destructive termites species is likely to be restricted to the southern United States, because Formosan termite eggs will not hatch; in an environment with temperatures below 68 °F. A single colony of Formosan termites, may contain several million individuals, that can forage up to 300 feet into soil; making them difficult to eliminate. In fact, once established, Formosan subterranean termites have never been successfully eradicated; from an entire area. 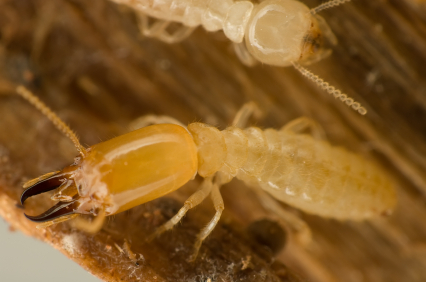 Because of the large size of its colonies, and the Formosan termites’ ability to consume wood at a rapid rate, these pests are responsible for a tremendous amount of damage to property; which often results in extensive pest control treatments and costly home repairs.